Simple alternative Implementation of Prototypical Networks for Few Shot Learning (paper, code) in PyTorch. 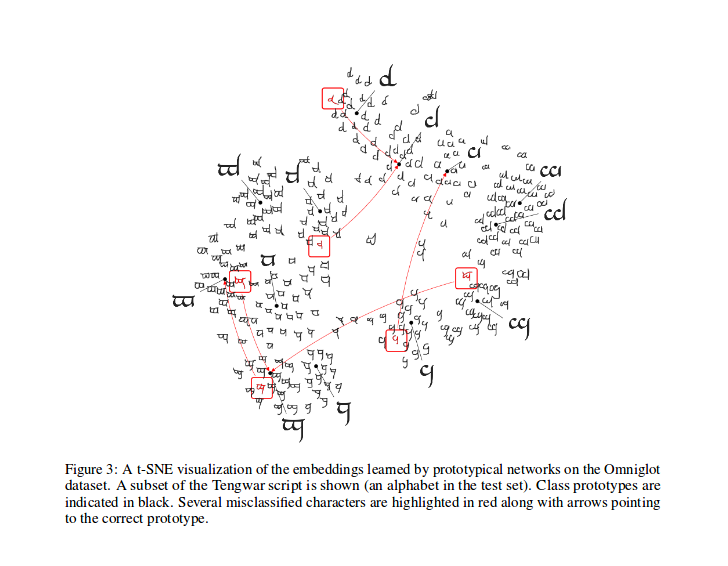 As shown in the reference paper Prototypical Networks are trained to embed samples features in a vectorial space, in particular, at each episode (iteration), a number of samples for a subset of classes are selected and sent through the model, for each subset of class c a number of samples' features (n_support) are used to guess the prototype (their barycentre coordinates in the vectorial space) for that class, so then the distances between the remaining n_query samples and their class barycentre can be minimized. After training, you can compute the t-SNE for the features generated by the model (not done in this repo, more infos about t-SNE here), this is a sample as shown in the paper. Kudos to @ludc for his contribute: https://github.com/pytorch/vision/pull/46. We will use the official dataset when it will be added to torchvision if it doesn't imply big changes to the code. We implemented the Vynials splitting method as in [Matching Networks for One Shot Learning]. That sould be the same method used in the paper (in fact I download the split files from the "offical" repo). We then apply the same rotations there described. In this way we should be able to compare results obtained by running this code with results described in the reference paper. As described in its PyDoc, this class is used to generate the indexes of each batch for a prototypical training algorithm. In particular, the object is instantiated by passing the list of the labels for the dataset, the sampler infers then the total number of classes and creates a set of indexes for each class ni the dataset. At each episode the sampler selects n_classes random classes and returns a number (n_support + n_query) of samples indexes for each one of the selected classes. Compute the loss as in the cited paper, mostly inspired by this code by one of its authors. In prototypical_loss.py both loss function and loss class à la PyTorch are implemented. The function takes in input the batch input from the model, samples' ground truths and the number n_suppport of samples to be used as support samples. Episode classes get infered from the target list, n_support samples get randomly extracted for each class, their class barycentres get computed, as well as the distances of each remaining samples' embedding from each class barycentre and the probability of each sample of belonging to each episode class get finmally computed; then the loss is then computed from the wrong predictions probabilities (for the query samples) as usual in classification problems. Please note that the training code is here just for demonstration purposes. Running the command without arguments will train the models with the default hyperparamters values (producing results shown above). We are trying to reproduce the reference paper performaces, we'll update here our best results. Copyright (c) 2018 Daniele E. Ciriello, Orobix Srl (www.orobix.com).